Yorkshire is home to some of the best game shoots in the country. How many of these are on your bucket list? The vast county of Yorkshire with its varied landscape contains hundreds of good shoots so this list represents just the tip of the iceberg when it comes to driven shooting in the white rose county. This 30,000-acre plus sporting playground on the banks of the Wharfe is owned by the Duke of Devonshire. It lies at the southern edge of the Yorkshire Dales, and with high pheasants and some excellent grouse shooting on the moors, it really is very special. Meanwhile, the Wharfe also provides some pretty good fishing. To top it all off, the estate boasts one of the finest sporting hotels in the county – the Devonshire Arms is splendidly positioned to offer the sort of relaxed atmosphere, fine food and top-notch service that really puts the icing on the shooting cake. 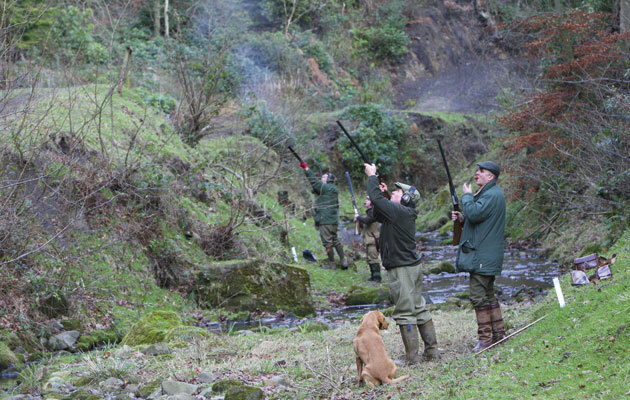 Duncombe Park is right in the heart of North Yorkshire shooting nirvana. Helmsley is the charming market town at the epicentre of this driven shooting smorgasbord in the land of steep valleys and even steeper birds, where so many excellent shoots vie for attention. People travel from far and wide to enjoy a few days of neck-craning, wallet-busting sport every season in this part of the world and it’s really not hard to see why. Pay a visit in November in your shooting breeks and for once you won’t feel like you are in the minority. And at the heart of the Helmsley estate lies Duncombe Park, with a high proportion of the shoot taking place in classic English parkland. With more than 13,500 acres and in excess of 60 drives – encompassing everything from ravines to wooded valleys – the shoot offers 250- to 500-bird days and a wide variety of excellent sport. It’s no surprise that Duncombe Park has an international reputation for delivering the goods in the most stylish of ways. In recent years the resurgence in driven grouse shooting in northern England has been one of the great stories in shooting history. Technical advances in medicated grit and sheer numbers of keepers on the ground on the big moors have led to a series of bag records being broken, and the lucky few who have been involved have been spoilt beyond their sporting dreams. Many moors have seen this huge success but Gunnerside in stunning Swaledale stands head and shoulders above the rest. This 36,000-acre moor is owned by billionaire Robert Miller, an American by birth who now has British citizenship. He has used his considerable resources and his sheer love of grouse shooting to create something very special indeed in Yorkshire’s most northerly dale, and with it he has brought considerable employment to the whole area. Not many of us will ever be lucky enough to enjoy the thrill of a driven day at Gunnerside but we can all appreciate the time, money and love that has gone into making it an outstanding success story of modern day grouse shooting. Mulgrave is famous for its coastal drives but the inland drives are pretty special too. This visually stunning shoot has been a favourite for a number of seasons now, not least as a result of the awe inspiring drives at the foot of the imposing cliffs. Here guns line out on the rocks with the North Sea crashing around them while the birds are pushed from one clifftop to the next. As they soar overhead guns get the chance to test themselves in some of the most dramatic scenery in the world of driven shooting. The rest of the shoot is not half bad either and with hospitality in the grand Mulgrave Castle this is the sort of shoot where fairytale dreams come true. Mother Nature has done driven shooting plenty of favours in many regions of the UK and this shoot is no exception. The Yorkshire Wolds might have been made with modern day partridge shooting in mind. Forget the classic ideal of coveys of Englishmen hurtling over East Anglian hedgerows! This is redlegs cruising at high altitude across the seemingly purpose built glacial valleys. These gifts of nature are just wide enough to give the guns below a sporting chance, just high enough to make the birds the bookie’s favourites and just long enough for a team of eight to peg out in comfort. Add the recent addition of a superbly well appointed shooting lodge, some decent pheasants later on and the chance to shoot simulated game in the summer months and it’s not far from the perfect sporting package. The name has become synonymous with high quality shooting in North Yorkshire in recent years and the sheer range of sport on offer is extraordinary. Whether you want to shoot pheasant, pigeon, partridge or deer the options are all available here. But it’s for driven shooting that Rievaulx has earned its reputation and the estate covers approximately 5,000 acres of this beautiful part of North Yorkshire around the River Rye. Nearby Helmsley has often been described as a shooting Mecca in high season and its not hard to see why with its collection of excellent hotels, and the sheer number of good shoots within half an hour’s drive. Like so many other parts of Yorkshire the ground has already been prepared to a certain extent. Nine valleys are separated by stretches of arable farmland where game crops can be used to their maximum effect to ensure birds travel at some speed across the guns pegged out on the valley floors below. With a flexible attitude to providing for the sporting needs of all visitors the estate can cater for anything from small walked-up bags to much larger driven days with single or double guns. You’ll be hard pressed to find a shoot manager who is more organised and particular in his pursuit of the ultimate day in the field than Frank Boddy, and his methods have made Ripley Castle one of Yorkshire’s most popular sporting destinations. A day at Ripley Castle is an ultra efficient affair but the strings are being pulled so subtly that you don’t realise how much is going on around you. There are no yardsticks or raised voices here. Days start and finish at the Boar’s Head in the centre of Ripley, and whatever the season guns will be treated to an astonishing array of drives in woodland and rolling countryside. One of the unique aspects of a day at Ripley Castle is the chance to attend one of the shoot’s McRipley days, all held in conjunction with the neighbouring Eagle Hall & Ashfold Side shoot. Here guns can add partridge, pheasant, duck, woodcock and grouse to their bag in a single day. As the man himself says, these particular days can go on for a while so plan a quiet evening afterwards! Is Yorkshire the ultimate fieldsports county? The focal point of the Cunliffe-Lister’s estate just 15 minutes from the A1 on the edge of the Yorkshire Dales is the castle at its heart, which is now run as a luxury hotel. The sprawling 20,000-acre estate has been in the family since the 1880s and it stretches from the River Ure in Wensleydale up onto the heather moorland high above. When the family acquired the estate it was one of only two premier sporting estates for sale in the country, the other being Sandringham in Norfolk. And legend has it that the Royal Family visited Swinton and decided the pheasants were too high so they plumped for Sandringham instead. Well, everyone’s a winner as they say, because that means the Cunliffe-Listers got to lay their hands on this sporting goldmine. With such a wide variety of habitat, ranging from heather moorland on the tops to the deep wooded valleys below, it is no surprise to discover a wide ranging quarry list at Swinton, including grouse, partridge, pheasant and duck shooting. And if you need a bit of practice or tuition or just fancy a quick blast on the clays, then the Warren Gill Shooting School sits on the estate and offers plenty of options for all levels of shooter. The hotel has a gun cabinet and boot room, and is just a short walk from the estate yard and game larder where guns meet and disperse at the end of the day. And if all that doesn’t sound tempting enough then how about some of the famous names from the past who have enjoyed the shooting here? These include ex Prime Ministers Neville Chamberlain and Harold Macmillan and even Bing Crosby! On the exposed northern edge of the North York Moors National Park, with the industrial heartland of Teesside just visible in the distance on a clear day, lies the rugged and beautiful Urra estate. Here the harsh landscape makes for some breathtaking shooting, with steep sided valleys, wild moorland fringe, and strong winds bringing wild weather in straight from the North Sea. Since 2005 the present owners have improved and developed the shooting here and now offer high quality driven game pheasant and partridge. But don’t worry if you and your friends aren’t all high bird aficionados, capable of doing a passable impression of George Digweed, Lord James Percy and Sir Edward Dashwood. Due to the varied terrain the estate can cater for teams who want more accessible sport too! Overall it’s a family run shoot with a clear emphasis on offering visiting teams the best day’s sport in an informal and friendly environment. The purpose built shoot bothy is at the heart of the shoot and provides the perfect meeting place in the morning and a warm welcome after a day in the wild weather out on the moors.